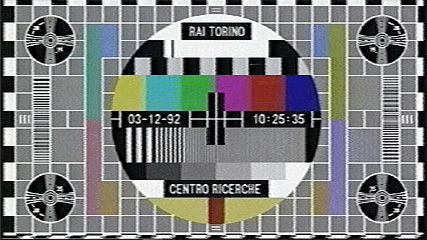 Test patterns are the best thing on TV. Testbild, the German name for them, which I'm sure we'll all agree sounds SO much more cool, are the only content of this medium which derives from the medium itself. They exist only for the proper adjustment of electronic circuits. 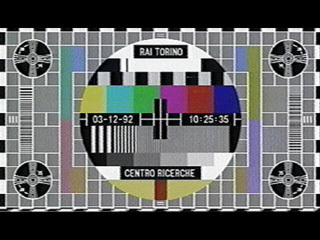 Everything else is on TV, but the test pattern is TV. Testbild, like good art, are frozen in their esthetic eras. They're peculiar to their own technological stages of television's evolution. This gives them their ultimate artistic power, as not only do they clearly articulate what kind of television people of the era wanted, but what kind of world. After all, even testbild are made by people. They test where we were that year: our hopes, our semiotics, and our aspirations. Early testbild had circles on them, because a circle was the hardest thing to get right. Now they have colored bars, so technicians can set the right picture on a scope. This mechanical scope picture, which is put inside specially engraved lines, is the only absolute esthetic standard in television. If the people turn purple but the waveform is still accurate, well then purple people it is. In a more heroic era, this Native American warrior appeared, usually with a blood-curdling sine wave, to let sleepy viewers know that their plug had been pulled for the night. This was an age of tube video and iron men. Everything on this test pattern aided viewers and broadcasters alike in their nightly dial twiddling, extracting Ultimate Truth from the base jargon of linearity, contrast and sync. Current generations will never know the sheer wonder of being a tiny child, and waking up at five in the morning, and sneaking down to surreptiously turn on the TV, and seeing their very first Indian, and realizing for the first time what television was really about. We can only use our imaginations, and think back to this more honest era, and be happy, as if Santa Claus came every day. But it gets even better! Just behold the mighty Phasmajector! Who needed digital? 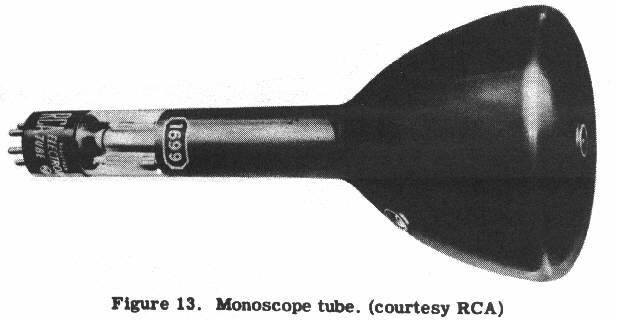 Many times, the Indian sprang, in full battle dress, from deep inside this wonderful, and very purposeful looking, TV tube, which created magic pictures for beaming into the sky. AKA the monoscope, because these alien scenes came from a simple box with a wire at one end, and nary a lens or lamp in sight. It worked by scanning images printed, in plain ink, on a screen built permanently into the tube. Sort of a precursor to electronic graphics, sort of. Gasp. Finally, I'd like to give you a hugh-scanned, non-authoritative Indian Test Pattern all your own, and just like the ones that sprang so magically from these tubes. Oh, such beauty! Such pure, esthetic power! So much more meaningful than the whole O.J. Simpson trial! Now, is this good TV or what? Thank you, oh departed , still owner of this industrial icon, for reminding us of video's true artistic potential. because it's very special anamorphic testbild! and, despite its potential for the capture of souls, comes highly recommended. if you can't fall off? NOTE: this testbild has a PLUGE! 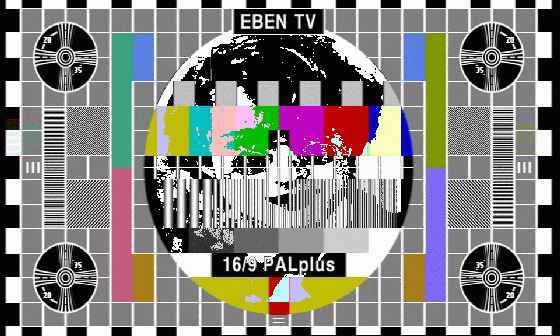 And a truly awesome EBEN test pattern for 16:9 PAL plus! No really. 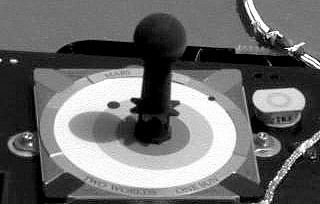 It is the calibration target used by the Spirit Mars rover. The Panoramic Camera (Pancam) has two eyes, but no colors. It uses filter wheels in the lenses, just like some old color photographic processes used to. Old-time Photoshop hackers remember this kind of channel mixing/tweaking only too well. The middle of the target has a 3-step grey scale. Boundaries also represent the orbits of Earth (inside) and Mars (outside), plus the relative sizes of the two planets. The outer chips at left and right on the outer ring (next to the bolts) are mirrors, to show sky color. At the bottom, the outer ring says TWO WORLDS, ONE SUN. This refers to a secondary use of the lighting indicator in the middle, after someone noticed it made a really neat sundial. You can actually tell the time on Mars! 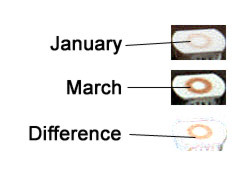 Positional and orientation information in the photo headers enables software to correctly position an Analemma-like overlay. At the top, we see the word MARS through the Pancam's left eye (shown), and EARTH through the right. 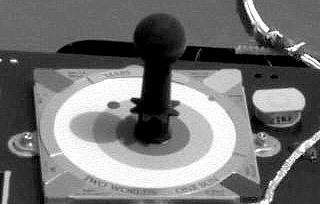 The device to the immediate right of the calibration target, right above the bolt holding the thing down, is a powerful ring magnet. Its job is to accrete an O of Martian iron-oxide dust onto the light surface, so various different observations of its buildup and composition can create useful information. Pancam filters are a bit narrowband for photography, having been chosen for geology, and certain single hues can turn pink or blue when they really aren't. Since so much IR and UV observation is being made, the calibration color chips were designed with second peaks outside the visual range. This can make them look rather goofy in certain filter combinations. Prowl around the Internet a bit and you'll find all manner of sites claiming that Mars really has a blue sky, or that the government is covering up the knowledge that Mars has been taken over by various combinations of NWO, NGO, George Soros, and the Amish. I'm staying out of this one. Here's why. It really works! No funny glasses required! Cross your eyes so there are 3 images, get the pointy rock in the middle all lined up, and remember the joy of your first View-MasterTM. Wonder how the Indian would look in one of those. Here's the complete list of Pancam filters.